(T.2) A/SP 3 07 overstruck FAMAGUSTA A/SP 7 07 on KE7 ½pi (SG.62). (PML.4) horiz. "A10" in black applied Kingstown overstriking red vertical "A10" (PML.5) used Georgetown on QV 1d black (SG.18). 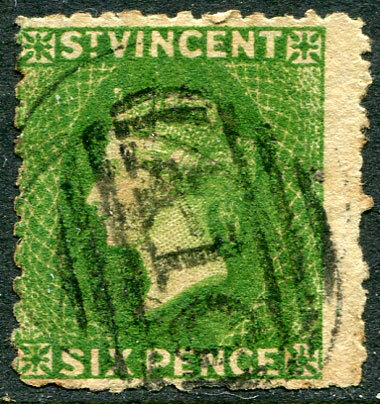 a rare combination dated during "81" on marginal position 1880 QV 6d bright green (SG.30, Cat.£70), some light toning. left side sliver in black partially dated N- -- (80) overstruck full horiz. 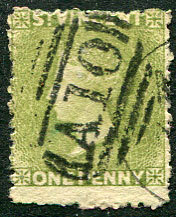 "A10" on lower marginal QV 1d olive green (SG.29). 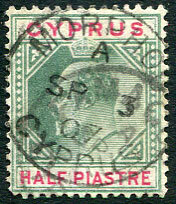 The QV 1d olive green issued June 1880, only six full strikes of the "MES" are currently known period JU 15 1880 to JA 12 81. Thereafter the "Circle of Dots" was almost certainly used on mail from Mesopotamia. 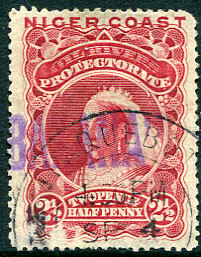 in red dated AU 11 73 on QV 1d black (SG.18) overstruck black horiz. "A10" (PML.4) at Kingstown. in red dated JU 8 75 overstruck black horiz. 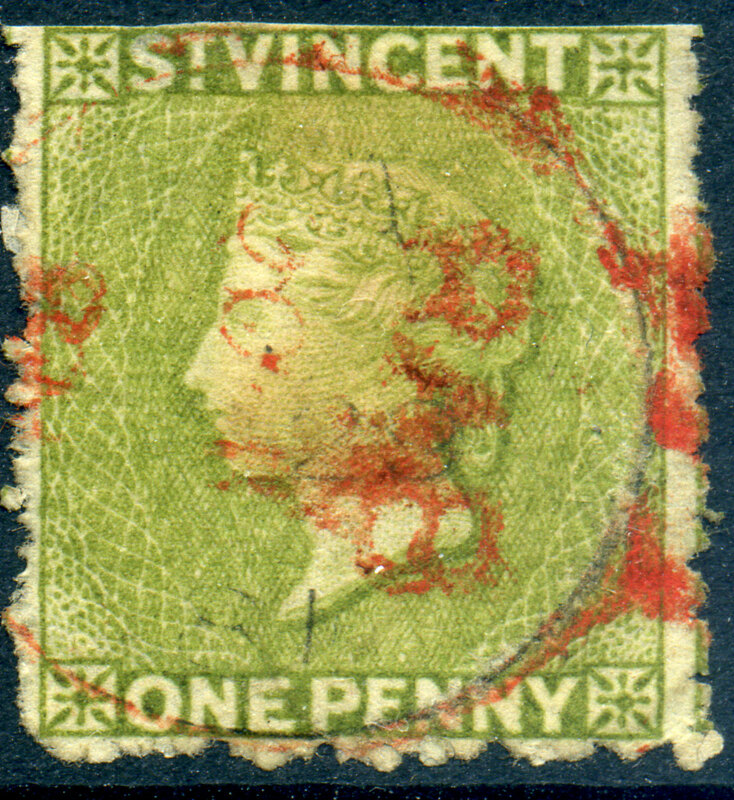 "A10" at Kingstown on 1875 QV 1/- claret (SG.21, Cat.£250). 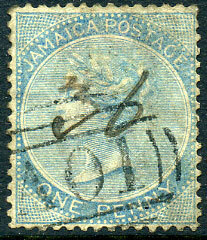 (SQC) dated A/M5 8 94 with JAMAICA/TELEGRAPHS/M5 8 94/BROWNS-TOWN on QV 1d Keyplate (SG.27), a rare error with both cancels having "M5" for month. 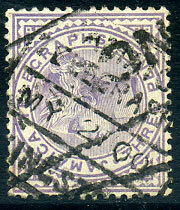 in black manuscript dated 20 5 07 overstruck ZUNGERU MY 28 1907 d/ring on KE7 ½d (SG.20). MY 21 00 with framed CANCELLED on QV 3d TELEGRAPHS Crown CA wmk. currently unique combination red "RAB" OC 23 81 and black "CA" OC 28 81 on QV 1d olive-green (SG.29), straight edge at top. 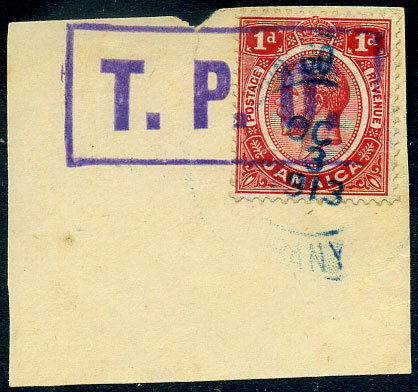 combination purple boxed T. P. O. 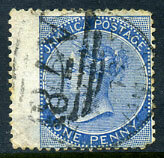 (D1) and central portion blue ALBANY (S3a,D2) dated OCT 3 1913 on KGV 1d (SG.58) piece. 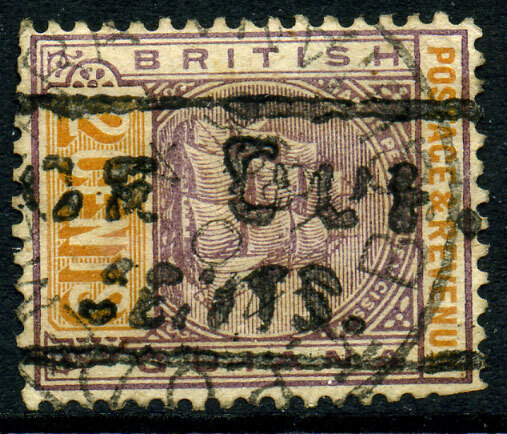 combination purple boxed T.P.O. 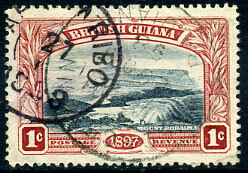 (D1) and part blue ANNOTTO BAY (S3a,D4) dated SEP 24 19(13) on KGV 1d (SG.58) piece. 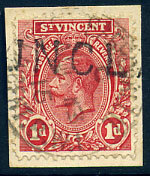 (PML.5 in red) on 1872 QV 1/- deep rose red (SG.17) overstruck black horiz. A10 at Kingstown, superb strikes. 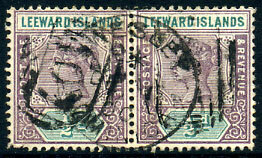 dated FE 16 18 with part boxed CANCELLED on KGV 1½d WAR STAMP (SG.74). 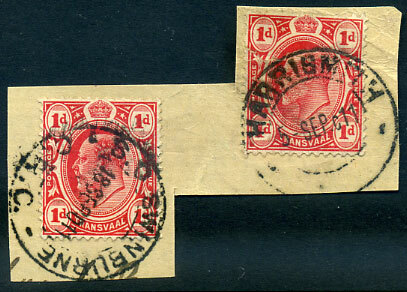 interprovincial use on TVL KE7 1d dated HARRISMITH 5 SEP 11 with further TVL KE7 1d dated SWINBURNE 18 SEP 11 as a result of localised forwarding, an unusual combination piece. 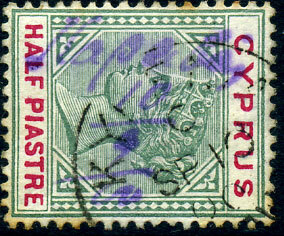 on 1894 QV ½pi (SG.40). 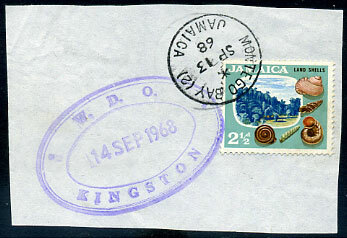 purple arrival TRD dated 14 SEP 1968 on QE2 2½d pmk'd MONTEGO BAY (2) */SP 13 68 piece. 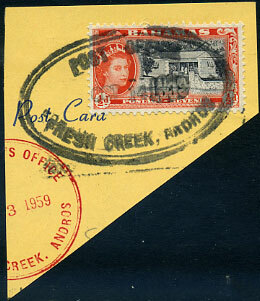 TRD dated OCT 14 1959 on QE2 ½d (SG.201) piece. 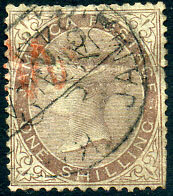 dated C/NO 15 97 overstruck Kingstown A/NO 16 97 on QV 1d (SG.48b) piece. 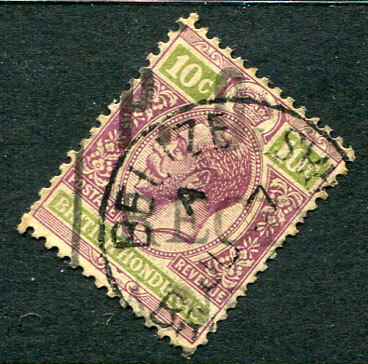 combination piece with GB KGV 1½d pmk'd 10 JY 31 and 8c Postage Due pmk'd 8 AU 31.
arrival dated D91/LIVERPOOL/SP 30 66 on QV 1d dull rose (SG.6, Cat.£55) pmk'd part A02. 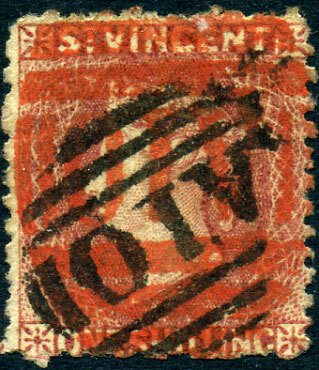 C/FE 14 02 on vertical pair QV ½d (SG.67) piece, lower stamp "killed" by BRISTL FE 26 02 arrival d/ring. 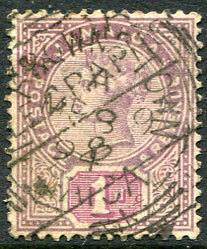 C/AU 13 15 on KGV 1d piece with part UNCL(AIMED) handstamp. 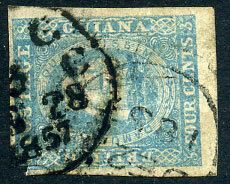 (1st Series) dated DE 28 1857 overstruck dated portion partial BERBICE dbl-arc for DE 29 1857 on 1855 4c pale blue (SG.20, Cat.£600), wide margins but downward scissor cut top right corner resulting in small portion stamp missing. (16 bar) on 4d (SG.18) with part SMITHFIELD broken dbl-arc, perf. toning. 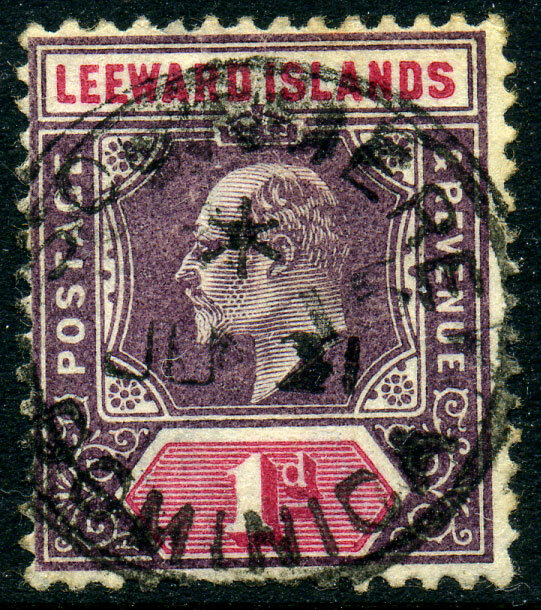 in purple ink on QV ½pi (SG.40), tear at left resulting in small internal puncture. 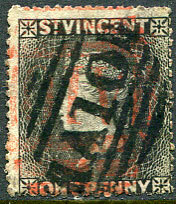 full upright and overstruck on 1896 QV ½pi (SG.40). (T7 I) 12 APR 26 on KGV 1d (SG.82b) showing part REDCAR arrival cds. 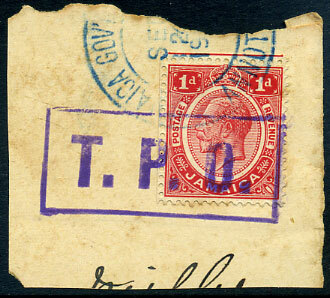 in red italics, possibly applied at Kingston Jamaica, on 1861 (1d) blue (SG.23) pmk'd Bridgetown bootheel "1". 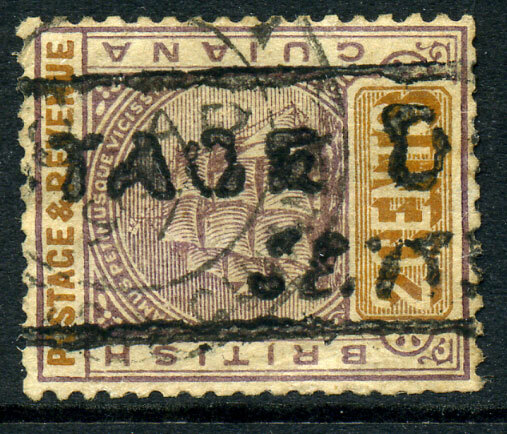 (T.2) dated A/JY 25 85 and C/-U 11 85 on QV 2d (SG.13), corner crease. in manuscript purple ink dated "10/9/00" overstruck KYRENIA C/SP 10 00 cds on QV ½pi (SG.40), perf. toning. part manuscript "(Akwan)aja Post Off. 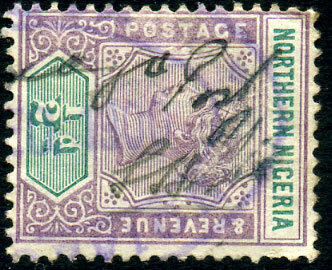 (initials)" on QV ½d (SG.1) overstruck part purple LOKOJO POST OFFICE d/ring part dated -- DEC 1900.
newly discovered combination (not known to Vincent Duggleby) of full large part black vertical "A10" (presumed PML.5) overstruck black horiz. "A10" (PML.4) at Kingstown on QV 1d black clean perfs upright star wmk (SG.18). 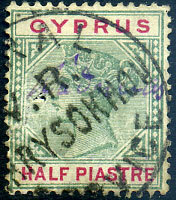 One of only two confirmed village recorded examples. 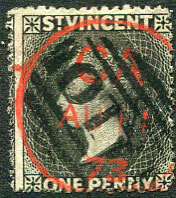 PML.4 oval A10 as used Kingstown recorded in black DE 12 72 to JU 26 75. 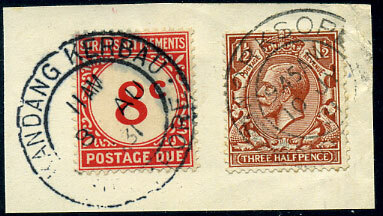 Jaffe mixed lot contained combination red "CA" JA 17 73 and black vertical A10 (PML.5 used Georgetown). 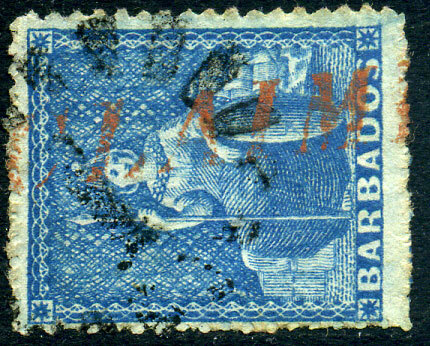 Earliest red "G" recorded JA 25 73. PML.5 in black had apparent short life at Georgetown period DE 2 72 to prior JA 25 73.
newly discovered combination (not known to Vincent Duggleby) of full black vertical "A10" (presumed PML.5) overstruck black horiz. "A10" (PML.4) at Kingstown on QV 1d black clean perfs sideways star wmk (SG.18). 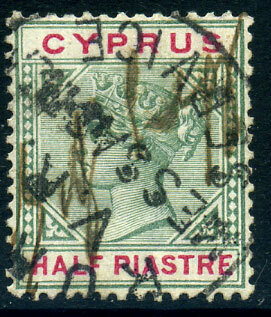 One of two recorded examples. PML.4 Kingstown A10 recorded in black DE 12 72 to JU 26 75. 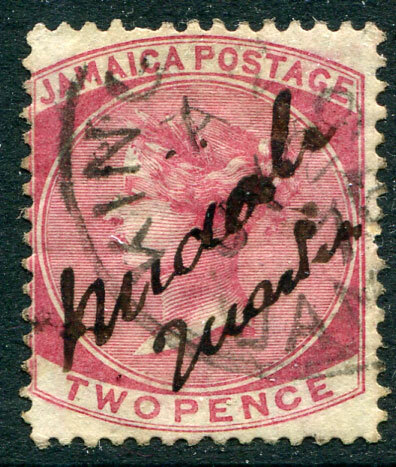 Jaffe mixed lot contained combination red "CA" JA 17 73 and black vertical A10 (PML.5 used Georgetown), earliest red "G" recorded JA 25 73. PML.5 in black had apparent short life period DE 2 72 to prior JA 25 73.
arrival dated 27 10 1898 over light GPO GEORGETOWN dated 26 OCT 98.
on QV 1d Pine wmk (SG.1b) overstruck clear Kingston A01 (Type A, found only on GB and Pine wmk issues). newly discovered str. 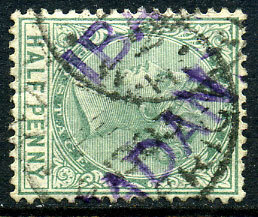 line (allocated 726.02 as without "FOR AIR MAIL") and unlisted 15mm high triangles in greenish-black nullifying "T" handstamp on KG6 ½d, 1d pmk'd FREETOWN EAST */11 OC 55 piece with added KG6 ½d pmk'd FREETOWN 28 OC 55.
struck over upright black manuscript "Gold Coast" on QV 1d blue CC wmk (SG.5). on QV 1d CC wmk (SG.8) with light KINGSTON MY 22 79 cds, small faults. (PD.1) with T.P.O. 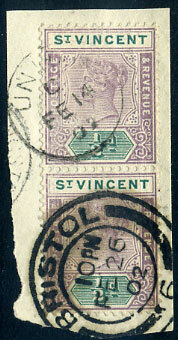 DEMERARA (T.7) dated NO 2 1896 on 2c (SG.234), some clipped perfs., rarely seen. 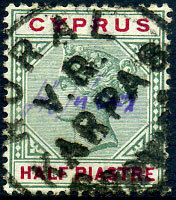 (PD 1) with large part d/ring showing last "A" of MAHAICA dated 8 AP 97 on 2c (SG.234), rarely seen. 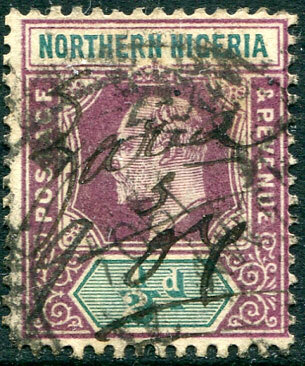 (T.Ry.18 - 4½mm high x 22½mm long without stop) full strike in two parts (inconclusive as to whether has stop) and dated with LAGOS FE 11 1903 cds on QV ½d (SG.21).